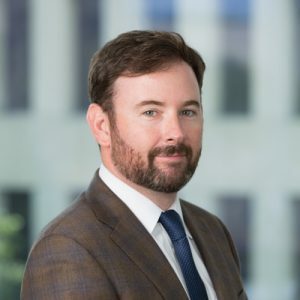 FORT WORTH, TX – Stephen L. Tatum, Jr., most recently a Deputy Commissioner of the Texas Commission on Environmental Quality (TCEQ), has joined Cantey Hanger LLP as a Partner. He will advise clients in matters involving the environment, energy, and eminent domain, as well as government and regulatory matters. At the TCEQ, the second largest environmental regulatory agency in the world, Tatum counseled Commissioner Toby Baker on overall direction and policy of the agency, as well as final determinations on contested permitting and enforcement matters. He also advised on legislative and legal issues and acted as liaison between Commissioner Baker and other governmental entities, including the Governor’s Office and the Texas Legislature; state agencies such as Texas Parks and Wildlife, the General Land Office, and the Railroad Commission; and federal agencies including the Environmental Protection Agency and the White House Council on Environmental Quality. While at TCEQ, Tatum and Commissioner Baker on behalf of Governor Greg Abbott implemented the RESTORE Act, the federal law governing the expenditure of more than $5 billion in penalties arising from the Deepwater Horizon blowout and oil spill. This involved representing the State of Texas on the federal RESTORE Council and managing all aspects of the Texas RESTORE program, including strategic planning, project selection, compliance with state and federal law, and communicating with local and statewide elected officials. Through this work he developed an extensive knowledge and appreciation of the Texas coastal environment and economy, as well as some of the legal issues involved in offshore exploration. Tatum was the lead author of The Deepwater Horizon Oil Spill: A Review of the Historic Civil and Criminal Liabilities From America’s Worst Environmental Catastrophe. (Texas Environmental Law Journal, Fall 2017). Prior to the TCEQ, Tatum served for five years as an Assistant Attorney General to Attorney General Greg Abbott, first with the Transportation Division litigating eminent domain acquisitions for TxDOT and then on the Opinions Committee, where he researched, drafted, and edited official Attorney General opinions interpreting state law, including overarching questions of constitutionality and fiscal matters at the local government level. Tatum graduated from Wake Forest University with a Bachelor of Arts in History and from The University of Texas School of Law (2009). He is admitted to practice before the United States District Court for the Eastern and Southern Districts of Texas. His father, Stephen Tatum, is a Partner with Cantey Hanger whose practice focus is appellate work. This entry was posted on July 10, 2018 by Tony Lansford.